As we know, King Solomon tells us to approach everything with wisdom and prudence. But in this jittery post- housing crash time when uncertainty seems to rule, myths and falsehoods spring up every day – and they can derail the career of even the most dedicated investor. 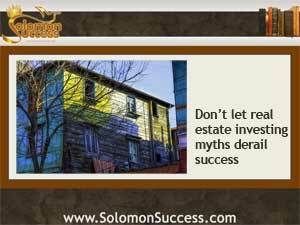 Here’s a look at five myths about real estate investing – and why, as Jason Hartman says, they’re dead wrong. Interest rates are rising, though not as fast as some predictions claimed. The Federal Reserve’s decision to slash another $10 million from its “Quantitative Easing” project makes it likely that rates won’t remain at the historical lows of the recent past. But according to a recent post on Realty Share, rising interest rates — and even rising home prices – haven’t in themselves meant a slowdown in the market or reined in returns for smart investors. The sweeping changes to mortgage lending standards that followed the housing crash and the string of lawsuits against the big banks were aimed at imposing some accountability on the mortgage lending market, and protecting consumers. In that way, the new regulations do make it harder for marginal buyers to get financing – and that means fewer foreclosures down the road. But lenders are still free to make whatever loans they choose – although for those that fall outside the standards of the Qualified Mortgage Rule, they won’t have legal protections if the loans fail. The Supply of Available Houses Isn’t Keeping Up With Demand. All real estate is local. While some hot markets are tight, with few homes for sale and fierce demand from buyers that’s not true in all areas. What’s more, the backlog of foreclosed homes dating all the way back to the housing crash is still being cleared at varying rates around the country. That’s one reason why Jason Hartman advocates being an “area agnostic” open to investing in a variety of different markets. It’s Hard to Make Money In Real Estate Today. While the housing market has taken some major hits, the road to recovery looks pretty solid – and real estate is the one investment that endures. Rental markets are booming, and the pool of renters continues to grow, as more people are choosing to rent and homeowners lose their houses to foreclosure. Laws vary, but the independent investor/entrepreneur is usually on a par with a residential home buyer for lending rates and eligibility for refinancing and other support programs –as long as the investment is limited to a few properties or a small number of units in a multiplex.